Ives and Benoit families cut the ribbon on their new homes. For the first time ever on Thursday, a Vineyard school bus made a stop at 801 State Road in Aquinnah. Out walked 12-year-old Laina Benoit, backpack and smiles in tow, ready to cut the ribbon on the official opening of her new home. The Benoit’s new home was a decade in the making. When Helen Mays sold her property on what’s now called Smalley’s Knoll at a discounted price to the town, selectmen and voters decided the land would be a good opportunity for an affordable housing project. With that in mind, they donated the purchase to the Island Housing Trust, a nonprofit dedicated to creating sustainable housing opportunities for low-to-middle income Islanders. Then the trust, with the help of Island banks, contractors, and architects, worked to finance and design two single-family homes on the site. They held a lottery for qualified applicants to purchase the homes for $255,000, and broke ground on construction in December. That was 10 months ago. Now, what was once a vacant lot with a few junipers has been converted to a permanent and indelible future for two Island families. On Thursday that future became the present. At the groundbreaking in December, the Ives’s son Louie was barely bigger than the palm of his mother’s hand, crying in her arms throughout the ceremony. But the tears were gone on Thursday afternoon, as the one-year-old waddled around the property, exploring the site of future playdates, birthday parties and barbecues. Louie and Laina will have lots of room for growth in their new homes. The shingled structures have fully-finished kitchens with an attached living space, two bedrooms and a bathroom on the first floor. Five of the six acres on the property were set aside for conservation, and Community Preservation Act money will help create a public trail behind the homes. 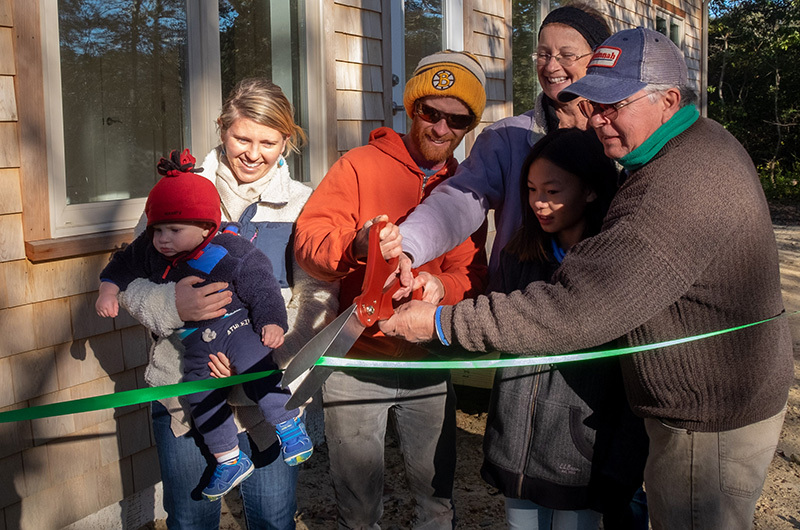 Williams Building Company, a Falmouth-based contractor responsible for the project, left the upstairs and basement unfinished so the families could adapt the spaces to their personal needs. “Over time, as we can afford it, we’re going to finish the basement and add a bed and bath upstairs,” Ms. Benoit said. 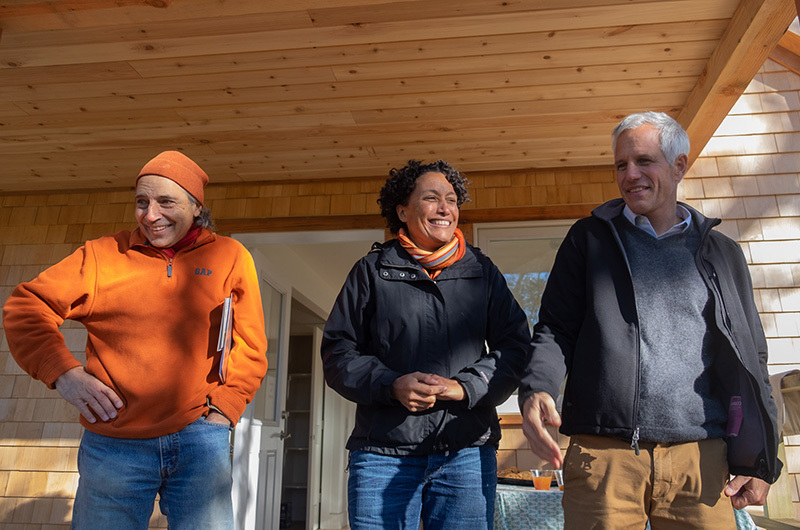 The housing trust recently completed a project in West Tisbury called Scott’s Grove, and is currently in the middle of developing the Greenwood Townhouses in Vineyard Haven. The basements of the Smalley’s Knoll homes, although unfinished, have pre-insulated fiberglass walls. Because they are “panelized,” it took little time for Williams to line them around the foundations, allowing the contractors to make quick work of an initially troublesome construction site. Derrill Bazzy, who works for the housing trust, helped with the design of the homes. As Mr. Bazzy thanked the town, the selectmen, and the Aquinnah planning board for their work on the project, he told the crowd about a surprise phone call he received earlier Thursday morning. It was from Helen Mays, the property’s former owner, who hadn’t been on the Island for three years. She told Mr. Bazzy she was coming into town and wanted to see the homes. Although Ms. Mays didn’t make an early enough ferry to attend the ribbon cutting, Mr. Bazzy said the call just reinforced his feelings for the Aquinnah community. Two fine Gay Head families, highly deserving of this good fortune and the community that made it possible. Love! Congratulations to these families, and to IHT, and the town of Aquinnah for making this a reality. May they enjoy decades and decades of joy in their new homes. What a treasure for both families. The homes sound fabulous and affordable. 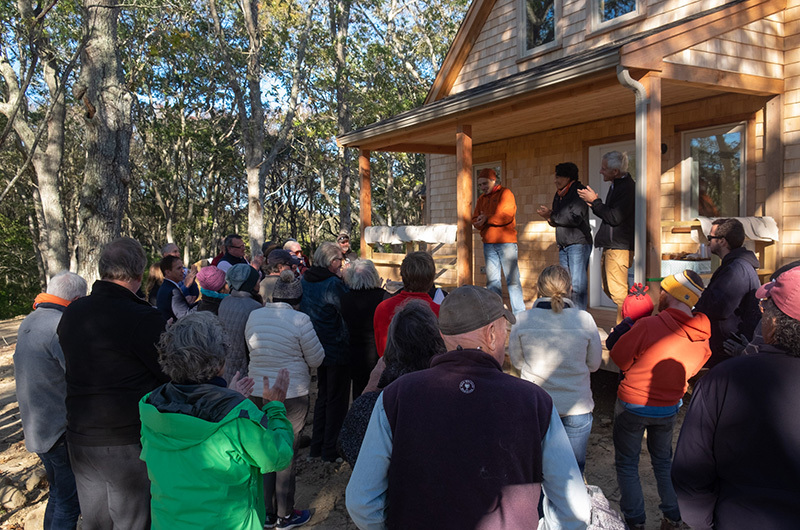 Congratulations to the families, the community, and all the folks who turned a dream into a reality and made these two Aquinnah houses happen.